Stylist & all-around cool girl, @foxyzingaro takes her favourite Resort 19 'Kismet' styles & shows us how she wears them her way. This collection is a bold introduction to Summer - vibrant, feminine & playful. There are some classic pieces that are must-have staples, like the Distant Stars Dress. I really felt so sophisticated in this one! Expect bright greens, hot pinks & pastels. 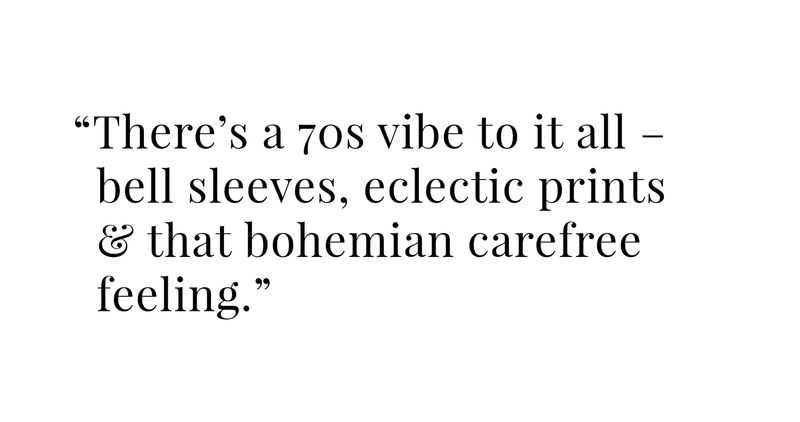 There’s a 70s vibe to it all – bell sleeves, eclectic prints & that bohemian carefree feeling. I tend to steer away from bold prints but I didn’t second guess the acid green ikat roses crop & hot pant set… Such a statement look! Pair this set back with a white sneaker to downplay the look. I let the prints do all the talking so made sure to strip back & keep my accessories clean & simple.